This is the fourth installment of the Egg School Series, and I'll be focusing how to prepare baked/shirred eggs. In case you missed them, definitely check out the entries on over easy eggs, poached eggs and sunny side up eggs. And as always, let me know if you have any questions, or post a comment about how they turn out. Speaking of baked/shirred eggs, you're probably wondering what in the heck happened to the official egg school order, as voted on by you the readers? (Baked/shirred was voted 9th, not 4th.) Well sometimes life gets in the way of order, and when I decided to make a pseudo-Mediterranean brunch for my visiting-from-out-of-town parents this past weekend, I knew my special baked eggs were the only appropriate style of eggs. So, needless to say, life won out over order, and baked eggs were bumped. And I think everyone was quite pleased with the decision. It's really a very good thing for you that baked eggs (I'll drop the "shirred" from here forward) were bumped. They are a relatively little known and highly underappreciated delicious and easy style of cooking eggs. They get a nice fluff and flavor in the white and a unique consistency of the yolk that is kind of perfectly halfway between a soft and a hard yolk. You can make them with a base of spinach or bread or even on their own, and they don't need any fat whatsoever to make them delicious. Actually, I think fat might mess them up a little. It allows you to enjoy the pure beauty of the egg nutritionally, texturally and palatably. The key to my baked eggs is a regular sized muffin tin. Decide how many servings of eggs you would like to make (a single pan can accommodate up to 12). Spray the number of muffin holes you decide upon with some nonfat canola cooking spray. Then, preheat your oven to 350 degrees. The next thing you need to do is decide whether you want plain eggs, spinach eggs or some other variant. You need a light layer of your selected ingredient on the bottom of each muffin spot you're using. I would stick to a single well-flavored ingredient. Obviously, for plain baked eggs, do not put anything on the bottom. My preferred form is sautéing some fresh spinach in a little canola oil, smashed garlic, salt and pepper until the spinach wilts down. 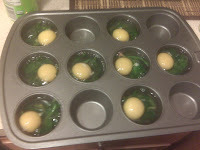 Then I put a small amount (like no more than a teaspoon) of the spinach in the bottom. That's all you need to do for the combination. A little round of bread in the bottom or a small spoonful of sautéed onions would definitely be other appropriate options. It's your choice, but since the egg bakes around it, it’s good to make it something with a little bit of constitution (not just a marinara sauce or something). Now that you have your pan sprayed and lined, simply crack one egg into each spot that you're using. Be sure that the white fully covers whatever you have lining the bottom. Then put the pan in the preheated oven and bake for 20 minutes. When done, the whites should be completely solid white. 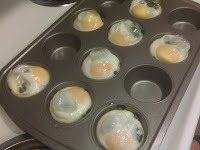 Use a soup spoon to carefully slice the edges and remove each egg from its muffin spot. Salt and pepper the eggs and serve with toast and whatever you would normally serve with eggs. Personally loving the spinach baked eggs, I like to emulate the baked eggs from one of my favorite breakfast spots in Ann Arbor, Cafe Zola's, and eat them with toast, tomato slices, feta cheese and kalamata olives. But obviously you can be as creative as you'd like. No matter what you choose to accompany the baked eggs, you are going to be enjoying one of the lightest egg delicacies that there is. And you'll wonder why this style isn't far more popular. It doesn't matter though – start making them and quickly YOU'LL become popular!